“Anti-white racism is growing in our cities.” It’s a statement that the French have heard several times over the past few years, during TV and radio interviews; debates; perhaps from their bigoted neighbour. But never before has it been heard publicly by a politician who isn’t affiliated with the far-right National Front (FN) party. Entitled “Manifeste pour une droite decomplexée” (loosely translatable as 'manifesto for a unabashed rightwing'), the book looks like a self-help manuscript meant to aid closet right-wingers with “coming out”. Copé’s message is one of reassurance – while “non-French” people have been painted as victims of racism for all this time, it’s the truly Gallic, truly white, truly Catholic people who are actually suffering. Copé feeds insecurities by calling “anti-white racism” a “taboo” that nobody dares talk about. He pledges to break the taboo in order to stop the silence that “aggravates the trauma” of the white victims. But who are these white victims? Well... Considering that Copé chooses to reside in one of the whitest, richest areas of central Paris despite his function as mayor of the multicultural constituency of Meaux, then I guess it’s hard for him to keep up with what’s going on in the impoverished neighbourhoods that he talks so confidently about. Even he admits that “the phenomenon is almost impossible to imagine from Paris”. That's not to say that racial tensions - of all kinds - don't exist in these districts. Quite the contrary! Something else we know for sure, is that people from the suburbs of Paris and Marseille – including Meaux – whether they are black, white, 'truly French', bullies or bullied, are some of the poorest in the country. Perhaps Mr Copé could think of a way to address that issue before he sets about stirring up even more racial hatred in neighbourhoods that suffer enough tension already. Unfortunately, 'anti-white racism' is an issue that sells better among Copé's target audience. In an attempt to match his increasingly fanatical talk, another candidate hoping to become party president failed to dismiss his rival’s chat as a publicity stunt on Wednesday, instead backing him up. Asked by journalists what he thought of Copé’s claims, François Fillon said that he was “not shocked at all”. Well, at least the FN are making sense for once. 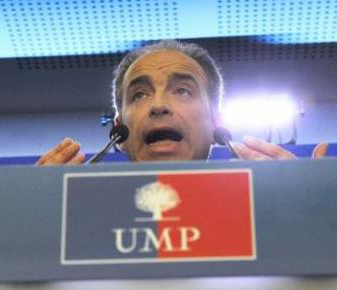 UMP party members will vote for a new president on November 18 and 25. This blog post was updated on Sept. 27 to include Copé's status as mayor of Meaux. Wow. And I thought us Americans were still having issues with race. It's really sad to see it spring up like this in other parts of the world. ...you'd think people would learn from our screw-ups. There is no such thing as "anti-white racism". Or "anti-black racism". Or "anti-Arab racism". It's just RACISM. It can happen to any group, it can happen to /every/ group...but fighting about it like this? Letting political parties take advantage of heated feelings like this? Dividing people over something like this? That's just sad. No one deserves to be treated like crap because of their race, but returning the favor helps NO ONE and does NOTHING. Moving to France from the UK I am shocked by the level of racism particularly that directed towards Muslim and Roma people in this country (not to say that racism is not a problem in the UK). For someone to suggest that white people being called names by black or arab people is racist shows a complete misunderstanding of racism. White people in France are not rounded up by the police outside the Eiffel tower and told to leave the area despite having their ID papers. White christians are not banned from wearing crosses in public. White people are not barred from employment by having a foreign sounding name or appearance. White people are not blamed for the economic problems caused by Europe's financial elite in the mainstream press. If an arab person or a black person calls you a 'from' in the street this is not racism. It is a reaction AGAINST the racism which that person has to encounter on a daily basis from other white people. Don't blame them, blame the plague of racism which permeates this society and challenge that instead of blaming the victim. I wonder if you talk about the same "above", as the comments appear from the back to the top. But I read the part you talk about, and she is obviously avoiding the problem. I made a lot of mistakes in my last comment, replacing mercy by misery, that has no meaning, or forgetting the s in "she talks". I would like to have statistics about high qualifications jobs, cause as far as I know, in high qualification jobs people just take the best ones, according to their criteria. However there is racism perpretated by employers, is it the topic here? There is also a complete parallel society that is rising, you blind. The topic is about the unsocial behaviors of those guys, nobody said all the arabs, or all the blacks, we more talk about the reality you don't face. Do you have a lot of "suburbs arabs" as friends? Don't they exist those "racaille"? Let say all people living in suburbs, will it be more pleasant or even more despising? What about chineese? Are we racist only against arabs and blacks? Well let's see... arabs are white indeed, we have more problems with arabs than blacks, don't we? Don't you think there is a problem between 2 cultures? Don't you think the international wars play a role in this polarization? The bad white imperialist, and the poor oppressed arab? That is what the governments are, and arabs governments are nomore good. the people is not totally responsible. When will you French media wake UP and see what is right in front of your eyes? Do you not wish to be French anymore? Is the culture that is usurping you, not assimilating, are they that much better than you? The idea that the people is close to the reality, and vip's are far from it seems to be quite true here. Only the author says about the problem "of course there are some racial tensions", and then talk about political solutions she would like to be applied. Please, listen, we are all products of our education, among "white" people, the cultural revolution and progressive ideas have deeply penetrated and, one can say a lot of basic racist intincts have been frustrated. This is just not the case in foreign origin families who don't share the same history, that we prefer protect from any strains in order to not hurt them or to not be seen as racist guys. "Racist" has become the most racist insult one can hear, the very privilege of young "foreign origin" guys, it has no meaning for those people, or not the same as us, they laugh at us in cinema, they look at us threatening, don't you live in the same country? I am always astonished they still feel so different, I have already heard one saying to others "you will never have french friends", like if it was a sort of impossible goal, they feel so different, fascinated and angry at the same time. We have to share the same ideas everywhere, and not spare anyone so they will feel like us, enough fake misery. They are allowed to be proud and to overshaddow dark parts of their culture, they are allowed to lack of critical thinking, what we nomore allow with our culture of "exhibition", debate, and equality. I am really disappointed to be kidnapped by the leftist because I consider myself as a leftist, I don't follow you here. It seems the people who wrote the comments above forgot to read the post, which says 'That's not to say that racial tensions - of all kinds - don't exist in these districts.' And while French whites might get snubbed as 'froms' (in reference for cheese eating) from time to time by French Arabs and blacks, whites do not get turned down for jobs because of their skin color or 'foreign' sounding name, like equally qualified French Arabs and blacks do all the time. The truth is the UMP has turned into a failure of a party and rather than focusing its energy into new ideas, is resorting to the kind of ugly scapegoating the far-right National Front has been perfecting for decades. So racism and violence targeted towards whites is not a problem then is it? It took me a while to fully understand the horrors of this text. It's a real shame that a French tax-payer funded website publishes anti-whiteism of this magnitude. Although on second thought maybe it's for the better that everyone can see the deep-seated arrogance and hatred towards whites - who will probably become a minority in France before this century is out - that the author has. Shame on France24. Apparently Sophie Pilgrim is trying to prove she possesses with this propaganda disguised as journalism a deep seated bigotry and Uncle Tom style racism? You display extraordinary left-wing bias. Are there any commentaries of comparable right-wing bias on France24 because, if so, I've yet to see any. Or have you simply abandoned any attempt to provide bias. There clearly are powerful currents of anti-white racism and Islamic chauvinism in France and it's amazing that the phenomenon has escaped official acknowledgement for so long. No doubt that is in large part due to the kind of biased reaction among journalists we see here.